Born in Montreal, A.Y. Jackson began his formal art studies around 1898 at Montreal’s Monument National under Edmond Dyonnet, then at the Art Association of Montreal under William Brymner. In 1905, he took his first trip to Europe, then in 1906 went to the United States to take classes at the Chicago Art Institute. After his return to Montreal in 1907, he sailed for France to study in Paris under Jean Paul Laurens at the Académie Julian where he was influenced by Impressionism. Subsequent to his studies he traveled and painted in England, France and Italy, returning to Montreal in 1909. In 1911 he was in France again, with trips to England, Italy and Hungry, returning to Canada in 1913. In May of 1913, Jackson went to Toronto, meeting future Group of Seven members J.E.H. MacDonald and Arthur Lismer at the Arts and Letters Club, and later, Lawren Harris. He took his first trip to Georgian Bay in this year, meeting patron Dr. James MacCallum, who offered him a stay at his Go Home Bay cottage and a year’s financial support if he took studio space in the now-famous Studio Building in Toronto. In 1914, he moved in, initially sharing his studio with Tom Thomson. Jackson began taking part in sketching trips with the artists who would become the Group of Seven, such as to Algonquin Park in 1914 with Frederick Varley and Lismer. 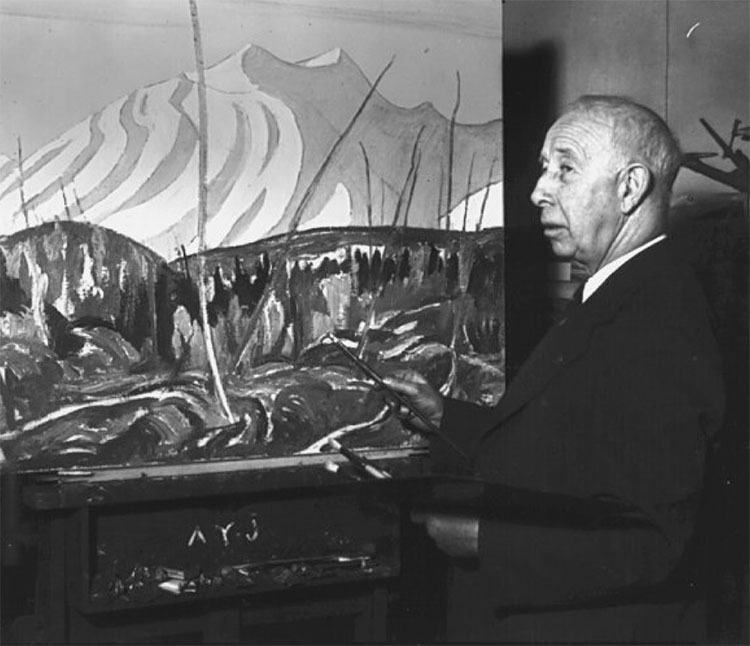 After seeing action in World War I in 1915, Jackson was appointed a war artist in 1917, and worked for the Canadian War Memorials until his discharge in 1919. In the autumn of that year he participated in the first Group boxcar trip to Algoma. A founding member of the Group, he exhibited with them throughout the 1920s and into the early 1930s. He was a founding member of the Canadian Group of Painters, formed in 1933. An intrepid traveler, Jackson developed long cycles of sketching trips to favourite painting places, and crossed the country from the Maritimes to British Columbia, and north to the Arctic and the Northwest Territories. During the 1920s he made almost yearly late winter / early spring trips to the north and south shores of the St. Lawrence, painting villages and rural scenes. Over the years his various Quebec sketching locations are too numerous to list. His first trip to Georgian Bay was in 1913, and he regularly visited there throughout his life. In 1926, he traveled to British Columbia to the Skeena River region in British Columbia with ethnologist Marius Barbeau and artist Edwin Holgate, in 1945 to the Interior and Cariboo regions, and in 1954 to Victoria and the Cariboo. The Arctic via the SS Beothic was his destination in 1927 and 1930. His last Arctic trip was in 1965 with McGill University’s Alpine Club. Although he had visited Alberta previously, his sketching trips there commenced in 1937, sometimes extending into the Rocky Mountains. He made many trips north: in 1938, 1949, 1950, 1951 and 1959 to Great Bear Lake in the Northwest Territories, Great Slave Lake and the Barren Lands in 1957 and 1959, and the Yukon in 1964. In 1955, Lake Superior became another regular destination when Jackson bought property with friends at Twidale Bay near Wawa in 1955 and built a cabin. Also in 1955, a milestone was reached when Jackson left his long-time base in the Studio Building in Toronto for Manotick, south of Ottawa, where he built his own studio; thus the Ottawa-Gatineau region became his new primary painting place. Jackson’s great affection for the Canadian landscape that he traveled so extensively, and his perception of the warmth, independence and hardiness of those who inhabited it has informed our sense of nationality. After a career in which he remained active into his eighties, Jackson spent his last years living in an apartment at the McMichael Canadian Collection at Kleinburg, where he died in 1974.